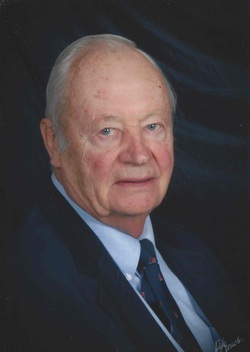 David O. Carlyle, a resident of Falmouth, Maine and the beloved husband of Marian K. (Krost) Carlyle passed away on Tuesday, October 30, 2018 at the Bridges by EPOCH at Westford with his family by his side, at the age of 89. Born in Bridgeport, Connecticut on May 14, 1929, he was a son of the late John and Elizabeth Carlyle, both Scottish immigrants to the US. Dave grew up in New Haven, Connecticut and worked in his Dad’s truck garage, saving enough money to put himself through college. He attended Case Western Reserve University in Cleveland, Ohio where he met, fell in love and married Marian. During the Korean War, he left Case Western to enlist in US Army and attended Officer Candidate School. Dave received his commission as First Lieutenant in 1953 as the war was ending and was discharged. He returned to Case Western University on the GI Bill where he complete his Bachelor of Science in Engineering in 1954. Later in 1970, he received a Master of Science in Business Administration from Syracuse University. Dave had an extensive engineering and management career across many industries. After college, Dave landed his first engineering position with General Electric in Syracuse NY. In 1968, he transferred to GE Aviation in Lynn MA. Dave and Marian moved to Reading, MA where they raised their three children and were active in the community. In the mid 1970’s, Dave took a management position with Stone & Webster in Boston, a company that developed nuclear power plants. As the popularity of nuclear power declined, Dave changed industries to work for Digital Equipment in Maynard MA. Digital offered him a position as plant manager in Mayaguez, Puerto Rico, where Dave and Marian lived until the mid-1980’s. They returned to Reading MA for a few years where David continued to work for Digital until retiring in 1991. Retirement included extensive travel, sailing, woodworking, and building their dream house on the shores of Thompson Lake in Otisfield, Maine, where they lived for 25 years. Dave and Marian loved Maine and became active members of the Casco United Church of Christ and the Otisfield community. Until age 75, Dave and Marian skied at Sunday River and were active members of the Prime Time ski club. As health and mobility changed their lifestyles, Dave and Marian moved to Oceanview Retirement Community in Falmouth, Maine. Surviving him besides his wife Marian, with whom he was married for 65 years are a son and daughter in law, Scott and Linda Carlyle of Westford; a daughter and son in law Christine Carlyle and Rico Cedro of Chicago, IL; three grandchildren, Raelyn, Cameron and Francesca; and a brother Cameron Carlyle of Woodstock, CT. He was also the father of the late William Carlyle who died in 2014. Share your thoughts and memories in the guestbook.